I had a bloomin’ good smoothie today. At Raoul’s on Talbot Road which is my surrogate office now that The Electric is closed. It was really fruity and thick and generous. I’ll be having one every day from here on out. Unusually for places round here, it doesn’t have WiFi which does mean that it looks less like an Internet Cafe than most places, but is pretty annoying for the peripatetic self-employed creative. I was going to bang on about the usurious prices charged by BT WiFi but God, that would be boring…so I won’t. Raoul’s is a cafe so doesn’t really merit review for the solo diner in that it shouldn’t really matter in what number you arrive at such a place. But the service was pleasant, the food is passable and the people- watching excellent. A couple of actors I couldn’t quite place and a bloke whose dreadlocks were really dreadfully dirty. The owner or manager was also there moaning about walk-ins making free with the disabled toilet and discussing the merits of Coca Cola in bottles as opposed to cans. I’m all for bottles. I think it tastes better. Someone told me once that it was because the bottled stuff was sweetened with cane sugar and the cans use beet. Something to do with varying preservative qualities. It makes sense but I’ve yet to verify that fact. If anyone reading this can point to somewhere I can check this out, I’d be very grateful. Anyway, it was so warm today that I didn’t stay there for lunch. I had a real crave on for some chilled soup and there wasn’t one one the menu and I had a fridge full of food so can’t really justify eating out. So I walked the 200m home in the glorious sunshine and knocked this up in under 10 minutes. There was enough for a cup of seconds this evening. THis would also be nice with some cucumber instead of peas (peel and de-seed) and some fresh mint, neither of which I had sadly. Set a pan of water on to boil. Meanwhile, chop the asparagus into 2cm pieces and slice the garlic finely. Drop the asparagus into the water and simmer until tender. Add the garlic and frozen peas at the last minute just to blanche it. Refresh the asparagus, peas and garlic in some cold water. While chilling, if using, make up a little stock from powder with a couple of spoons of hot water. I like Just Boullion Marigold Vegan or Tahedl, a German brand which has a lovely celery salt kick. When dissolved dilute with the 200ml of cold water. Add the cooked veggies to the stock and blend until smooth. Stir through the yogurt. Taste and season. To serve, spritz the prawns with lemon. 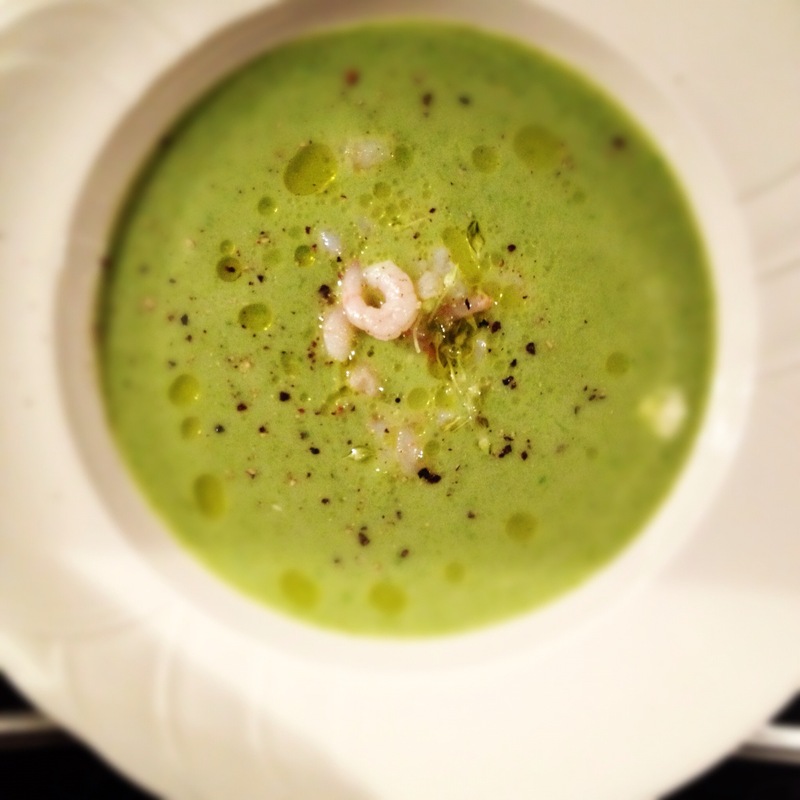 Put the soup in a cool bowl, add the prawns and drizzle with olive oil. Eat, in the shade, wearing something diaphanous.